As anyone who knows me will know, I’m a frequent traveller around Europe and the UK and so it feels apt that I should write a post about what it is like to travel frequently on planes, trains, metro systems, and buses as a wheelchair user (I don’t drive a car… yet!). Over the last few years, I’ve been a frequent traveller between Liverpool and Barcelona for my university studies. Personally, I enjoy travelling by plane, although it took a bit of getting used to at the start. Usually one is required to book assistance to get on and off the plane and around the airport a couple of weeks in advance – or at the very latest a few days before. So that the airline can ensure adequate space in the hold of the plane for my chair, I have to provide them with weight/measurements of the wheelchair and book the necessary assistance around the airport and an ambi-lift to get me onto the plane as I can’t walk up the steps. Providing the airline with this information has become much easier to do over the last few years as most airlines now provide online chat to book the assistance (yay, no more half an hour waits on expensive phonelines) and I have the information about my chair stored away, so all I have to do is copy and paste it into the chat. Generally speaking, one has to arrive at least an hour and a half before and the assistance will help me through the airport: my chair has to be tagged, I need help getting stuff out of my bag at security control, and, as I weirdly like to sit at the back of the plane (it’s easier to get me on/off the flight and I’m closer to the toilet in flight), I often need to use an aisle chair to get me on to the plane – this way, my wild arms don’t knock anyone’s head off as I stumble awkwardly down the plane. Personally, my favourite airline is Ryanair - although they are often criticised -, as, as long as one is organised with assistance and gets there at least an hour before the flight, they are relatively hassle-free and do not require mountains of paperwork to be filled in on the day as it can be done online beforehand. I’ve travelled tens of times across Europe with Ryanair and never had a problem, whilst every time I’ve travelled with EasyJet, there has also been difficulties on the day and a mountain of paperwork on the day (I can’t write on paper, so this is always fun and rather unnecessarily time-consuming). I love train travel and it’s my favourite way of getting across the country. Last year, I spent around 16-18 hours a week on trains crisscrossing the U.K. between Liverpool (where I was living), Birmingham (where I was studying), Manchester (for football matches), and London (for weekend work). So, you could say I’m something of a frequent train traveller then. 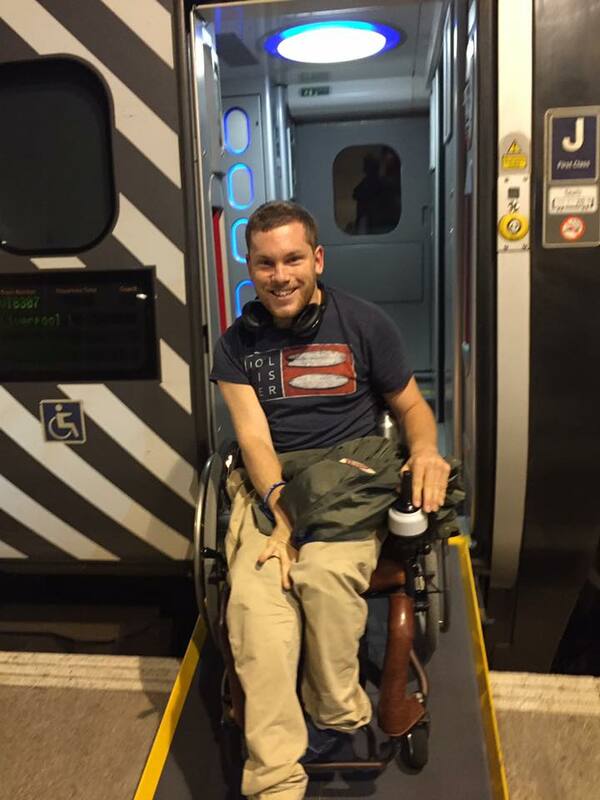 As a wheelchair user, I need a ramp to get on the train… That sounds simple, right? In reality, it can sometimes be anything but. Officially, one is supposed to book 24 hours in advance to get assistance at the station - although I've found that one can book as late as 1900 the night before (the time that the sheets are sent to the stations) and get assistance the next day. This means that I oftentimes can't spontaneously decide to take off on the train to visit a random city for the day as an able-bodied person can. Train assistance varies significantly between stations - my local station, Liverpool Lime Street, are fantastic (as are Birmingham New Street), whilst other stations, such as London Euston can require a longer wait (my longest wait for a ramp was 30 minutes and I’d booked assistance beforehand too). Whilst there is normally a ramp to get me on the train (provided that I book ahead and get there 20/30 minutes before the train departs – not always easy when you’re relying on public transport to get you there), there have been many occasions whereby I’ve been left stranded at the station I needed to get off at when a ramp hasn’t arrived or arrived 5, 10, or 15 minutes late. This is where train franchises become key. They vary as to how they treat disabled passengers requiring assistance: on some franchises (Virgin and TransPennine spring to mind as great examples), the train manager can unfasten the ramp and get you off, whilst, on others, you can be stuck waiting on an empty train (sometimes one that is boarding for its next trip) for 15/20 minutes until a ramp turns up. Another thing that’s a bugbear of mine is the limited facilities and seating that train companies give to disabled passengers. Legally, disabled passengers are not supposed to be allowed to get on a train where there is a broken or inaccessible toilet and should be seated in one where this basic facility is made available to them. Again, there are significant differences in my experiences of train companies in this area: Virgin are fantastic and will often move disabled passengers and their companions to carriages with a working toilet if this situation occurs, whilst, on around 60% of the services I’ve been on with a Midlands-based franchise, the one and only accessible toilet has been out-of-order and you’re often just expected to suffer on through (or told you can get off the train at Crewe to use the toilet and pick up the next service). Train design is something that can be an issue too: most services have fantastic wheelchair seats with tables and adequate space, however on others, one is left sitting next to or staring into a toilet or cannot sit next to the people they are travelling with. How accessible are the metro systems in London and Barcelona? Over the last few years, I’ve had plenty of experience with the metro system of Barcelona and London. Both systems have adopted the policy of having sections of their platform raised in accessible stations, so that wheelchair users (and, indeed, others) can get on and off the carriages without the need for assistance. This is great and makes it so much easier to travel at accessible stations. The downside is that not all stations are accessible for disabled passengers. In London, only 24% of Tube stations are accessible, making it rather difficult to get from A to B on the metro there (although the buses are great – more on that below). One of my most frequent routes in London involves me going from Hammersmith to Kings Cross and then having to cross platforms to get back to Euston Square, as only one side of that station is accessible via the lift. In Barcelona, 86% of their stations are accessible and more work is being done to improve this over the next few years; that being said, to get to my campus, I have to make three changes as the (fairly new) station nearest my campus isn’t accessible at all. In both cities, my fellow commuters will nearly always move out of the way of the allotted space so I can park my chair. One of the big differences I’ve noticed between the systems – aside from how many of the stations are accessible – is that the fact that in Barcelona, there’s always a clear sign on the platform telling the wheelchair user where to get on, whereas in London, such signage is only present at stations that have a National Rail connection. Not having a sign on the platform makes it incredibly difficult to know where the space to park my chair will be, meaning that I sometimes have to drive across crowds of commuters to find an accessible carriage. Bus access, over the last ten years, has increased significantly: nowadays, almost every bus has a ramp and is wheelchair-accessible. In theory, this is great, as one should be able to get on any bus one wants, however, in practice, this is often more difficult than it first seems. Badly-designed buses mean that there is often only one space available for wheelchair users on each bus and it is frequently the case that there is not a separate space for buggies/old people with their shopping carts; thus, these spaces can often be taken up by prams or others, meaning that there isn’t always adequate space to turn and park my chair. Until recently, what was supposed to be the wheelchair space was not legally designated as such: thus, if there was a pram on the bus, the driver was not required to ask them to fold it up or make space for the wheelchair user. This often meant that I could not board the bus and would have to wait for the next one to come along (sometimes this could mean standing for 20/30 minutes in the rain/cold with little protection from the elements). Fortunately, a recent ruling from the UK Supreme Court means that bus drivers now have to ask non-wheelchair users to move out of the space if a wheelchair user needs to get on. Hopefully, this will make it much easier to travel by bus as wheelchair user, without having to endure long waits because the bus that you want to get on has something other than a wheelchair in the wheelchair-designated space. Indeed, in recent weeks, I’ve been on several buses that have displayed freshly-minted “priority space for wheelchair users” stickers, so hopefully bus companies and their drivers will understand the needs of wheelchair users better in the times that lie ahead. I find the buses in London and Barcelona to be fantastic for wheelchair users, as they have automatic ramps – meaning that the driver doesn’t have to get out of his cabin and that a wheelchair user boarding does not necessarily slow the bus down – and bigger spaces for wheelchair users: in Barcelona, there are two spaces on each bus for wheelchair users making it so much easier to travel. Let me be clear, I love travelling by public transport, yet, at present, travelling as a wheelchair user requires a heck of a lot of planning and forethought. Maybe one day in the future, trains will have level-access points so that wheelchair users can just roll on and roll off without the need for 24 hours’ notice just for a simple ramp. In a dream world, somebody would find a way to make the Victorian era Tube stations of London have lifts so that all can use them, not just able-bodied people, but, sadly, finding the political will for such a capital-intensive investment is highly unlikely. Maybe more thought will be put into designing buses and trains that are intelligently thought-out: putting in fold-up seats so that prams can park easily on buses rather than have to fold-up for wheelchair users (this could also double as a second wheelchair space, if needed) and planning spaces so that wheelchair users are not sat next to/looking into smelly toilets for several hours. On balance, in the last few generations, great progress has been made towards accommodating wheelchair users on public transport, but that doesn’t mean that things can’t improve.